On February 1st a group of us attended a meeting in Toronto to discuss the rise of breast cancer rates in women working in the plastics sector and other industries. The meeting, hosted by the National Network on Environments and Women’s Health (NNEWH), focused on the issue of EDCs and their link to occupational rates of cancer in women. Recent research done by Jim Brophy et al and published in November 2012: Breast cancer risk in relation to occupations with exposure to carcinogens and endocrine disruptors: a Canadian case–control study outlined the increasing link of breast cancer to the exposure to hormone disrupting chemicals and carcinogens. This study of women who work in facilities that process plastics – many for use in the automotive industry – found a 5-fold increase in breast cancer rates for pre-menopausal women. The same statistically significant increase in breast cancer was found in pre-menopausal women workers in food canning facilities. Food canning uses Bisphenol A – a chemical used in epoxy coatings inside cans and known to be an EDC. The study also found a 36 percent increased breast cancer risk among women who farmed. Many pesticides, most notably atrazine on corn crops, are known to disrupt the hormonal system. However the relationship between occupational exposure to carcinogens and cancer is not a priority in research or in assessments of why someone gets cancer. Indeed as the research shows, links between occupational exposures and breast cancer risk have generally been neglected. With breast cancer as the most commonly diagnosed cancer in women in Canada, one would think doctors would habitually be asking woman about their occupation and work history to increase our understanding of the causes of breast cancer. But this is not the case. Can workers protect themselves from chemical exposure on the shop floor? Women in the plastics sector speak of how they are often coated in fine particulates, and witness accidents with smoke and increased chemical smells. Measures such as increased ventilation with scrubbers and changes in process can help alleviate exposure. But the tragedy of EDCs is that minute quantities in the parts per trillion range can cause long lasting reproductive damage and act as precursors to cancer. Women exposed daily to these hazardous chemicals cannot protect themselves using masks or venting and the cumulative impact of these chemicals that work at such extremely low doses highlights the need for an urgent and different response. The same holds true for our governments’ chemicals regulatory system. To date the Canadian government has no clear position on EDCs. True the government banned the use of BPA in baby bottles, but other uses of BPA in can linings, receipt papers, dental bonding and other plastic consumer products are allowed on the market. 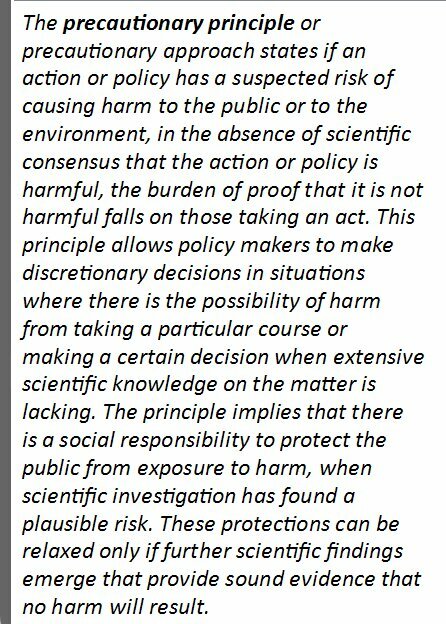 First the precautionary principle must become a fundamental value of our regulatory system. This principle is science based. and promotes action to move to safer alternatives. Contrary to its detractors, it is not a hindrance to industrial production or new materials development. It simply reorients the way we think about production and consumption so that negative consequences are identified and prioritized for substitution with innovative clean production systems. To achieve such a change in our production systems, the principles of prevention and public participation must also be foundations of our industrial and public health policy. Increasing scientific evidence of the impacts from EDCs necessitates we act now. Second we need a chemicals management system that targets chemicals of high concern for phase out and elimination. To date our regulatory system is rooted in assessing risk rather than assessing hazard first. Why is this distinction important? Hazard assessment of chemicals examines their inherent hazardous profile to ascertain if it is a carcinogen or a reproductive toxin or persistent in the environment, along with a host of other environmental and health impacts. This assessment is done using international lists and extensive toxicological review. Risk assessment, on the other hand, implies that there is no unsafe level for a chemical; it assumes that a defined amount of exposure is therefore allowable and/or that the hazards can be adequately controlled. Yet the emerging science of EDCs shows that chemical harm can occur at the parts per trillion range of exposure, effectively dismissing the assumption of exposure control. Unfortunately our risk assessment procedures still do not capture this new science. We need to reorient our chemicals management and occupational exposure regulations to put hazard assessment as the top priority and integrate EDCs into our assessment of what is hazardous. Once a chemical is known to be (highly) hazardous, the search should intensify for inherently safer alternatives. Exposure control will always have its place in informed decision making but it must not justify ‘business as usual’ particularly with hormone disrupting chemicals that are so widely used in products and manufacturing processes. In Europe, the Registration, Evaluation, Authorisation and restriction of CHemicals (REACH) regulation passed in 2007 is under increasing pressure from Members of the European Parliament and from scientists to integrate EDCs into the definition of chemicals of high concern. If successful, this will set an important precedent. All of this holds lessons for chemicals reform in Canada. Our chemicals management system must be reoriented to integrate endocrine disrupting chemicals into the regulatory framework. This would massively stimulate more research in green chemistry and make safer chemicals cost competitive through increased demand. Support Public Policies that advance these principles. The Guide gives many examples of how leading companies are screening their chemicals to identify inherent hazards, using tools like the GreenScreen (which take EDCs into account), disclosing their chemical ingredients. and substituting hazardous chemicals with inherently safer alternatives. We now need to mainstream these principles, tools and strategies. As we discussed at the meeting in Toronto, what we really need is a collaboration and coordination of efforts among workers, health practitioners, community groups, scientists, funders, women and the public at large to amplify the demand for safer chemicals through regulatory change and clean production practices. Let’s pull our resources together to hasten this transition.